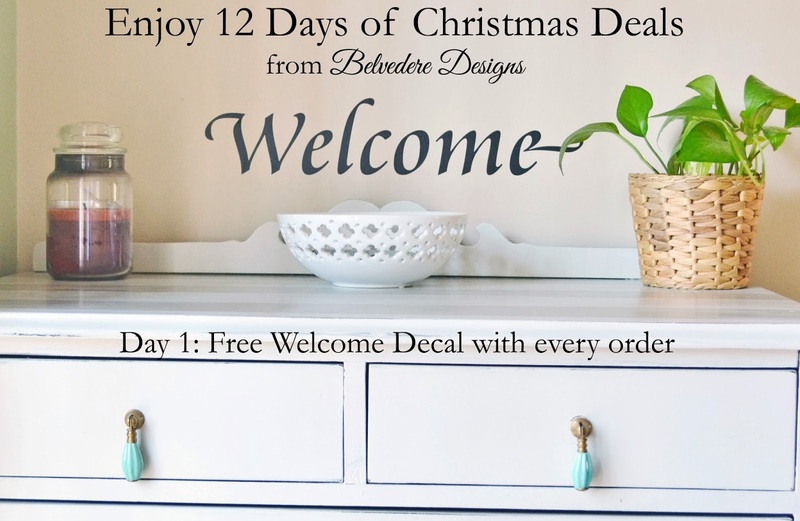 Happy 1st of December, Belvedere Designs fans! It's so hard to believe that November is behind us, and Christmas is right around the corner! Don't fret, though, because for the next twelve days, we are having a new promotion each day to help you finish up your holiday shopping. With our wide range of styles, colors, and products, there's a WallQuotes™ decal for everyone on your list! Today only, receive a free Welcome decal with any purchase! This decal is so versatile, use it to spruce up your front door, porch or entryway. You must let us know when you order that you would like one, though! Please ask for the "Day 1-Welcome decal" in the comments section of your order so that we'll know to include it with your order. Be sure to check back tomorrow (and every day through December 12th! ), for a new promotion!